Now, 10 days or so into fall, we are still completely busy with real estate, almost. I was able to get out sailing today from 3 till dusk. With the sun setting before seven now, and me still used to long summer evenings, dusk seemed to come quickly along with cold winds. Three in the afternoon was t-shirt weather, then a sweatshirt on top by five, and a foul weather jacket by six. 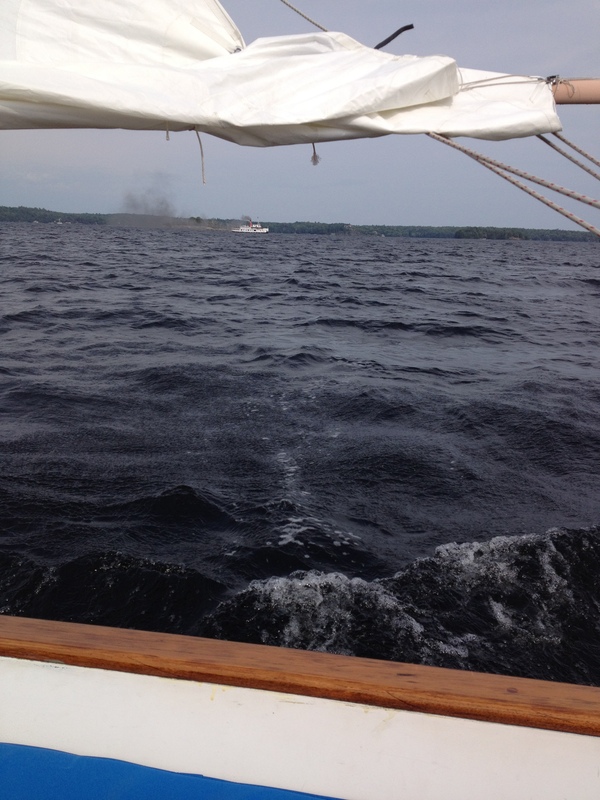 Sailing south on Lake Muskoka between Browning Island and the mainland. 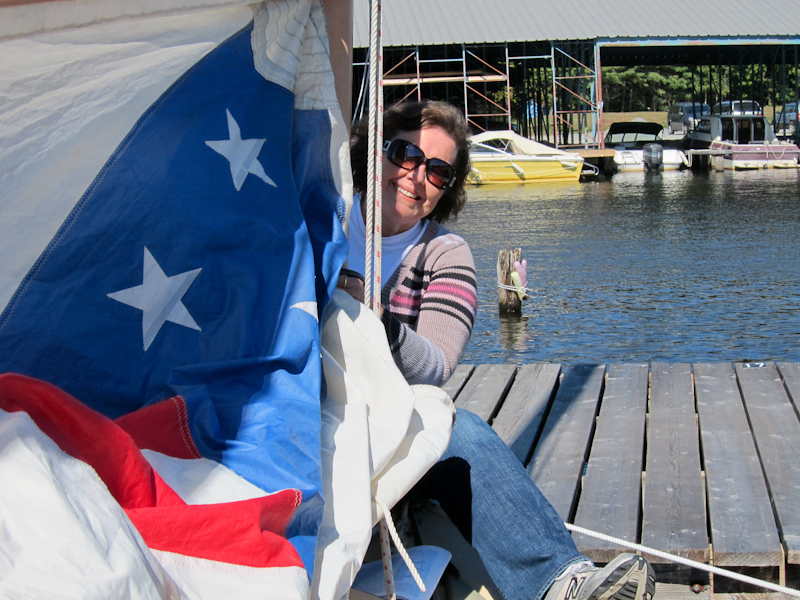 Flying the colours of the catboat Swell: the Ontario flag and the Catboat Association burgee. The winds were our prevailing northwesterlies, and in the afternoon at 15 knots with gusts required a reefed sail. By evening they were a nice steady 8 or so so the reef was blown out and I sailed back north. 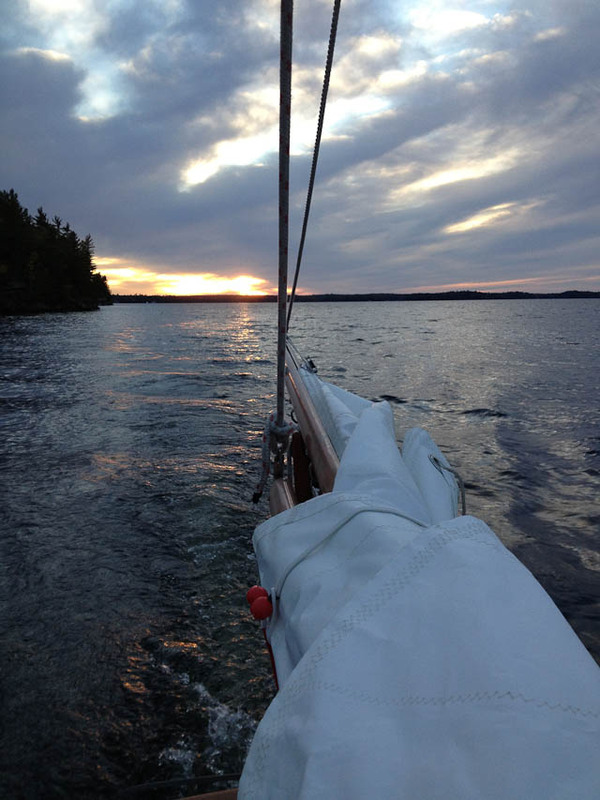 The evening sail was wonderful; once set, the boat stayed on track without any input from me. I was able sit back and take in the beautiful evening colours as the setting sun accompanied the boat back to Pine Island. Once I rounded Pine Island, the wind, blocked by the mainland, slackened and I dropped the sail and watched the following sun set to the west. Goodbye to a beautiful fall day. 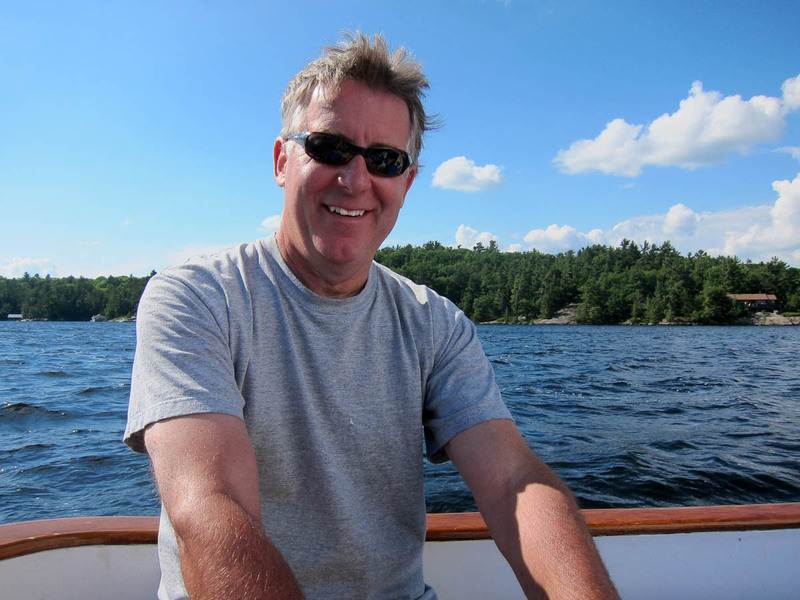 We had a couple of hours available after a pre-closing cottage walk-through on Lake Rosseau, and before a cottage showing on Lake Muskoka, so we got out sailing. Wind was primarily from the north west, gusting to 15 knots + at times; to the extent we had to tie in 2 reefs in the sail. 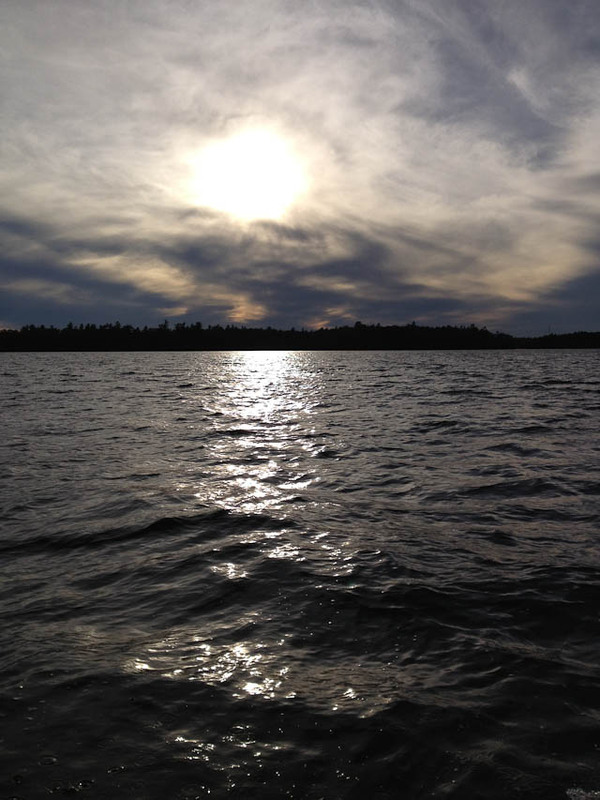 Lake Muskoka’s south bay was loaded up with whitecaps. Despite the double reef, or thanks to it, we had great control and the 18′ catboat reached the theoretical maximum hullspeed often – exhilarating! The Segwun was out for a while, then shot back toward the Narrows from Eleanor Island– either the cruise was overdue or the forecast was not good. We were pretty much headed back by then. Muskoka does need the rain. In between cottage showings and listings, on one of the busiest days of the summer -Saturday of the July 1st weekend – I had a small window of time to go sailing. The weather has been beautiful and quite windy for days, and Saturday was no exception. I had to reef the sail and would have tied in a 2nd reef, but by that time we were on our way back downwind. 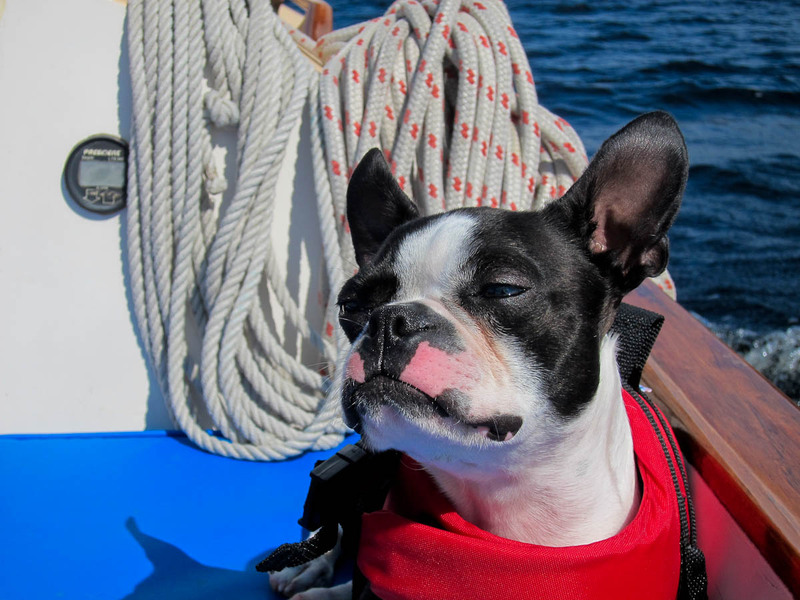 Obviously excited to get in some sailing time. Catharine was in the process of selling a great place on Moon River. Fortunately Neysa and Bentley were up for a quick adventure. 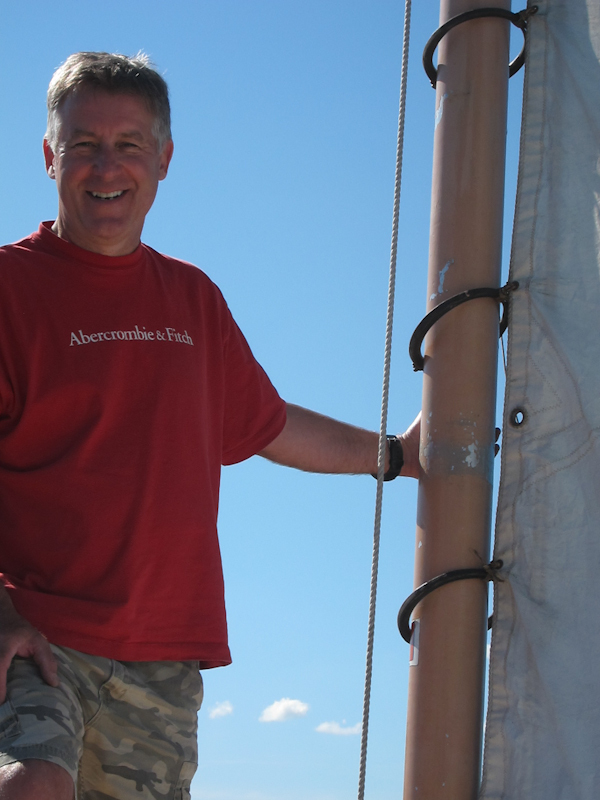 We sailed upwind from between Pine & Birch Islands, north of Beaumaris, then back. Neysa & Bentley. Bentley sniffing out some Island BBQ’s. 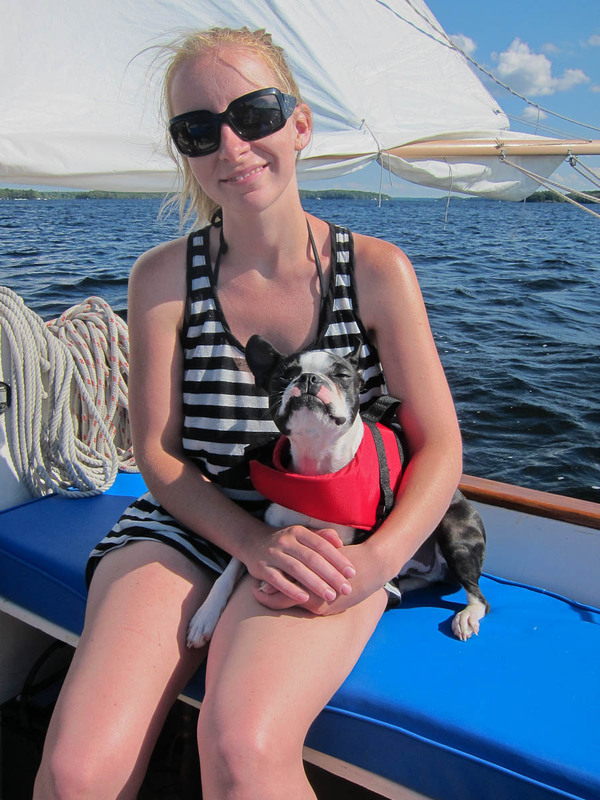 Now that Bentley is starting to enjoy the sailboat more – the boat treats from Lenore certainly helped – we have to be careful about exposure to the sun. We applied sunscreen to Bentley’s muzzle, but he kept licking it off!? Tips on using sunscreen on your dog. We did our best to keep him shaded but he had other ideas. Bentley after licking off the sunscreen, tries to catch some rays. Sunday was forecast to be a beautiful day: 18 degrees, sunny and steady winds. And, we had the boat fully ready to go. 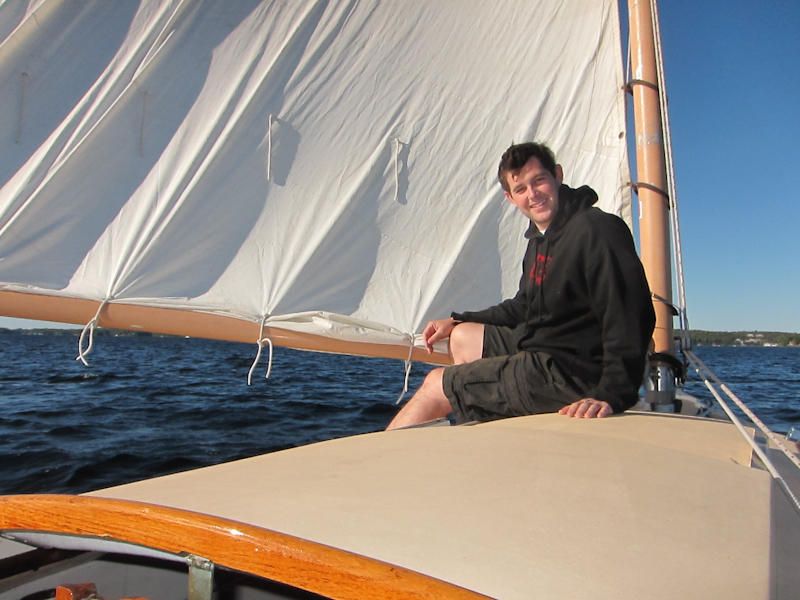 So, after some preparation – we had to tie the mast hoops to the sail and tie one reef in the sail – Catharine and I, and our son Chris and his dog Kirby were going to take the catboat on its first sail in Muskoka. 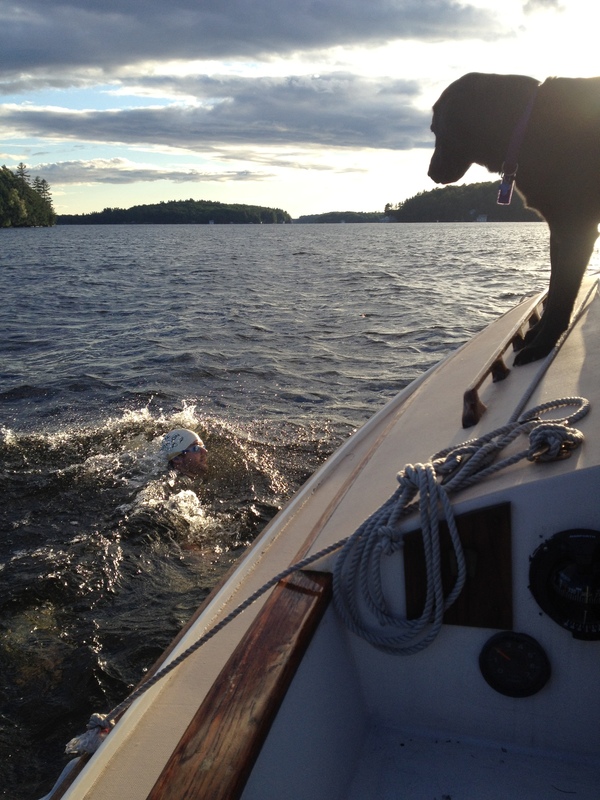 We headed out into Lake Muskoka and tacked through between Pine and Birch Islands. Catharine tied on the mast hoops one by one to the sail, while I tied in the reef. You can see the mast hoops in the picture below. In the lee of Birch Island on Lake Muskoka it was calm enough to go forward for a picture. For those who aren’t sailors reefing is a way to shorten the sail somewhat so as to not be overpowered by winds. You’ll see the reefing points tied onto the boom in the picture of Chris below. 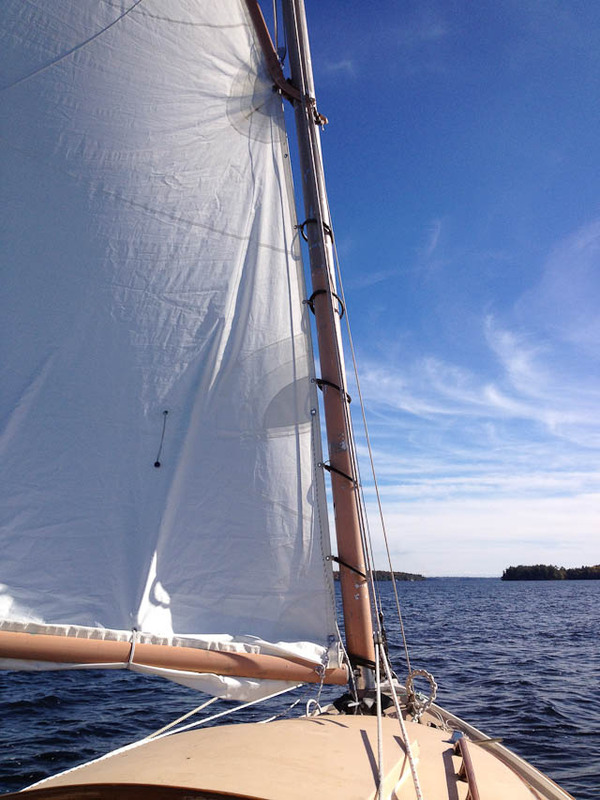 Sailboat in Muskoka – Rigging is completed, sails are on. Sailing is next. Completed a fairly complex (for me) re-rigging of our catboat. 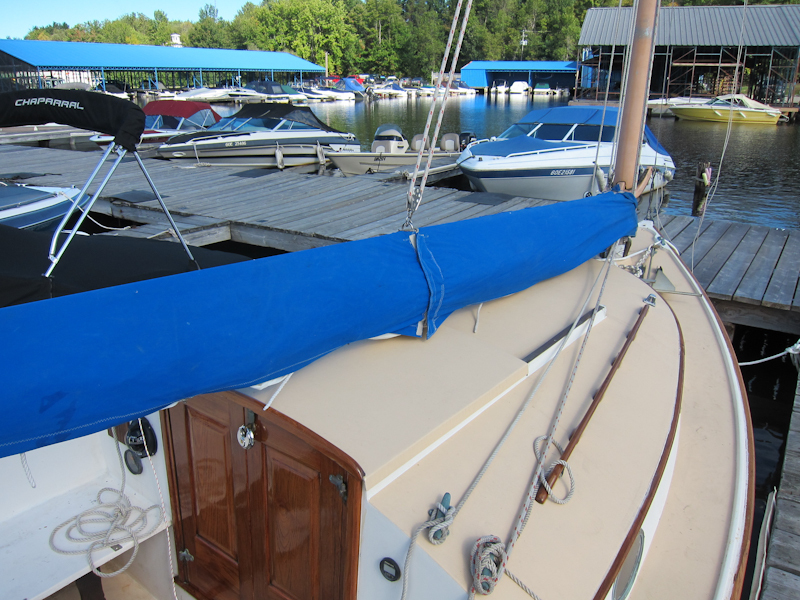 Because the sail is gaff-rigged, there is an additional spar, much like the boom that is above the sail. 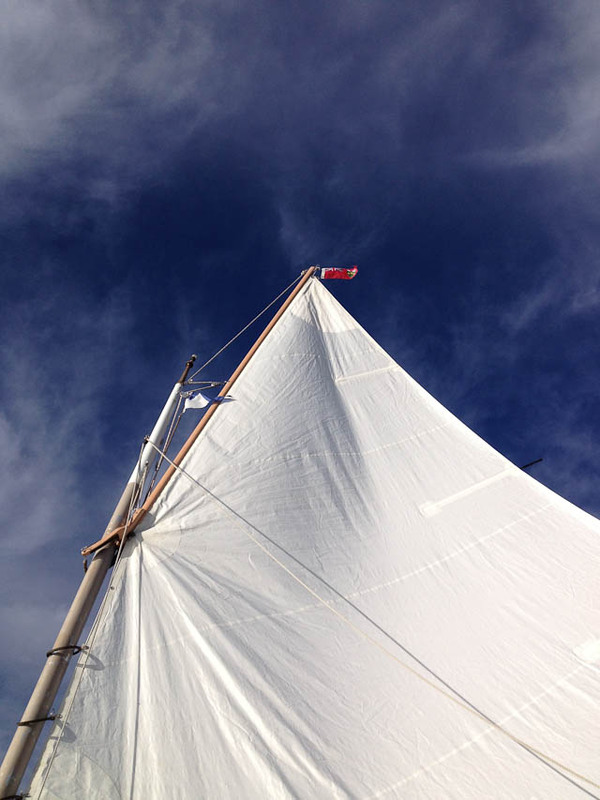 The luff (front edge) of the sail is tied to wooden hoops that ride up the mast when the sail is raised. “"The dust has finally settled” and we have with your significant assistance moved into our new cottage. Your service we would say “went above and beyond” what we expected. You were available when we were available which was no easy feat with our busy family….this was very helpful. Your assistance with finalizing the deal and great recommendations for local trades was well appreciated. Al, Liisa and the girls.